Personally, I think that all tech savvy people have agreed that the iPad is not only one of the coolest devices to be created but it has changed the way users, even non-tech users surf the net, read books, play games and communicate with each other. The only downside to the iPad is that after a lengthy session, the weight of the unit does become an issue for some people. This usually only happens to me when I'm tired and I'm putting all sorts of things beneath my iPad like cushions, newspapers clothes and whatnot to keep it supported while I have a break. The solution? 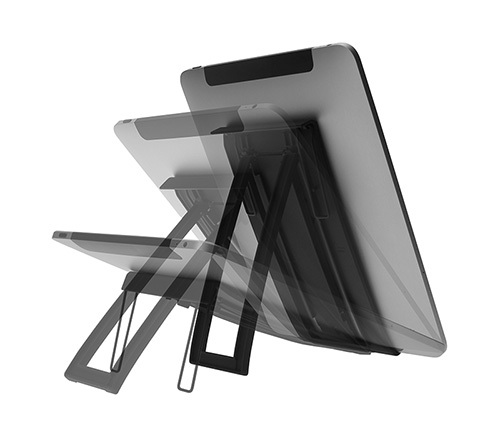 The Cygnett FlexiView, an adjustable stand for your iPad. This nifty little product allows you to position your iPad to three different set poses. By putting your iPad onto the FlexiView, either portrait or landscape, this product can then be moved to three positions that include typing, movies and presentation. It also supports an adjustable arm so when the glare hits your excellent retina display of the iPad, you can move it to another angle to hopefully minimise or remove the reflection. The design of the FlexiView is quite professionally built with a rubberised stand and non-slip base. The quality of the material not only looks decent but feels quite safe. We tested the FlexiView on a variety of surfaces and we had no slippage issues whatsoever. Another highlight of the item is that if you have a wireless Bluetooth keyboard connected to your iPad, this device basically turns your iPad into a workstation. I've tested a similar stand to the FlexiView but it's much more versatile and seems to be sturdier than its competitors. In the end, the iPad FlexiView is a well made product that I could easily recommend to those iPad users who are looking for a flexible stand. Not only is it well built but gives almost total control to the user in terms of manipulating the angle of their iPad. Whether it's set to the lowest setting to your table for typing (quite sturdy) or changing it to a movie or presentation mode, the Cygnett FlexiView definitely alleviates the need for unsafe practices and reduces hand strain.